We are in the midst of our first squash and cucumber boom of the season, and I had some time to reflect on this earlier in the week while wading through a sea of cucumbers. Cucumbers, summer squash, winter squash, and melons all belong to the vegetable family called the cucurbits. Give them enough sun, heat, and moisture, and they will put forth a rampant growth of vines, rapidly expanding and covering the ground with the solar collection devices we call leaves. The drawback to this rapid growth is that the leaves and stems are relatively flimsy structures. You can think of a squash stem in contrast to an oak stem, which grows slowly over time, but is built for the long haul. The cucurbit plants are susceptible to myriad insects and diseases, and once we start picking them (which happens three times a week), they are also prone to being stepped on or broken by a hand searching for harvestable fruit. All of this adds up to a solid boom-and-bust cycle for these crops, which is, of course, why people came up with pickles as a way of stashing away cukes from the boom times for the bust to come. So how do we deal with the booms and busts here at Simple Gifts Farm? We have a number of strategies which all boil down to different ways of helping the plants get a boost in the race between rampant growth on one hand and the various forces of death that will inevitably win in the end. We hope to get a bunch of fruits before that end comes. The first way is through succession planting—we plant once in our unheated hoophouse and then three times for the cucumbers and squash in the field (once for melons and winter squash, since they take more time to mature). We are thus planting every three to four weeks, planning on having a new planting coming in when the inevitable crash occurs. We also try to give the plants plenty of fertility, with the idea that more of that early rampant growth will translate into higher yields before the bust. This year we are applying some liquid fertilizers, both sprayed on the crops and through the drip irrigation. We also have a multi-pronged strategy for dealing with cucumber beetles. The earliest plantings are covered with row cover fabric, which exclude the little buggers and also make a warmer environment for the tropical cucurbits. After the plants start flowering, the pollinators need to get in, so we remove the row covers and sometimes apply a coating of white clay called kaolin that makes the beetles feel like they’ve landed on the wrong plant. The kaolin clogs up the sprayer, and needs to be reapplied to any new growth, and then is hard to wash off of the squash when we pick it, so at a certain point we decide that the plants are big enough to outgrow whatever damage the beetles might cause. As a last resort, we do have an organic insecticide we can apply, which we usually do only when we the plants are little and we can give them a jump by easing up on the pressure from the bugs. We hope you enjoy the summer squash, zucchini and cucumbers that embody the ephemeral abundance of life during our sweet summers. 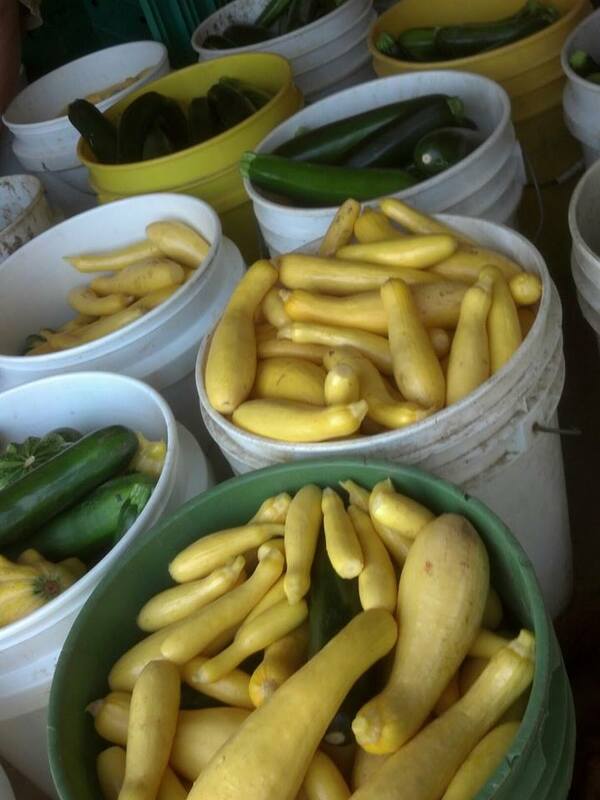 We encourage you to try pickling up some cucumbers, or try the summer squash relish and garlicky squash that are our featured recipes this week.